Until now the aprons featured here have been more or less functional and strictly female, so it's nice to take a walk on the frivolous side with this one. 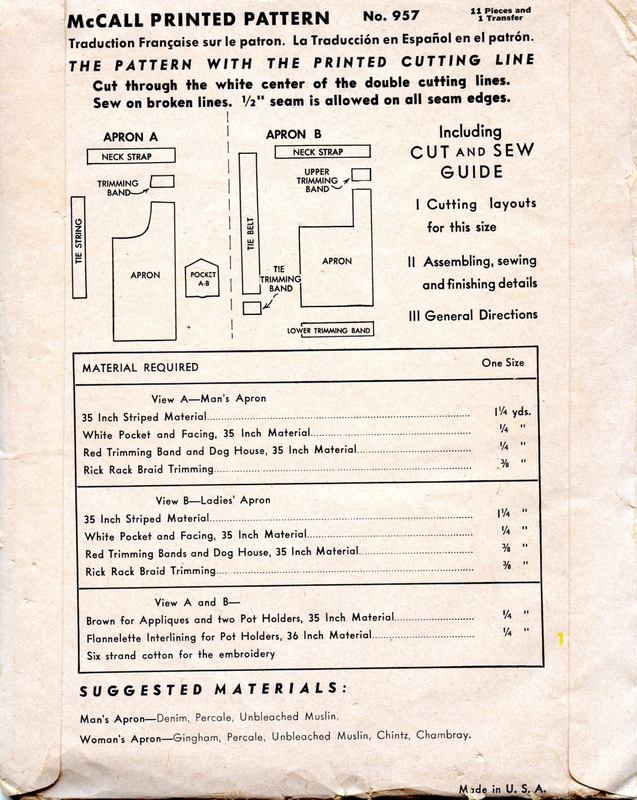 We saw our first unisex pattern with a 1934 smock pattern, also by McCall. 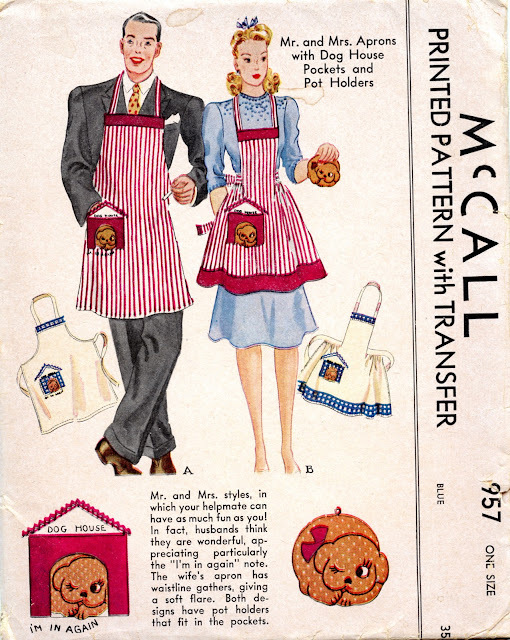 Mr. D. House wears a straightforward butcher's style apron, while Mrs. House's apron features a feminine gathered waist. The dog is actually a pot holder that slips into the front of the lined pocket. Note that the fabrics recommended for the gentleman's apron are denim, percale, or unbleached muslin, while the lady has the additional choices of gingham, chintz, and chambray. I would have thought chambray would be suitable for both. The recommendation of unbleached muslin, an inexpensive and not terribly sturdy fabric, is a clue that these aprons weren't intended to be taken very seriously - perhaps they were used as humorous wedding or shower gifts. This pattern has never been used. 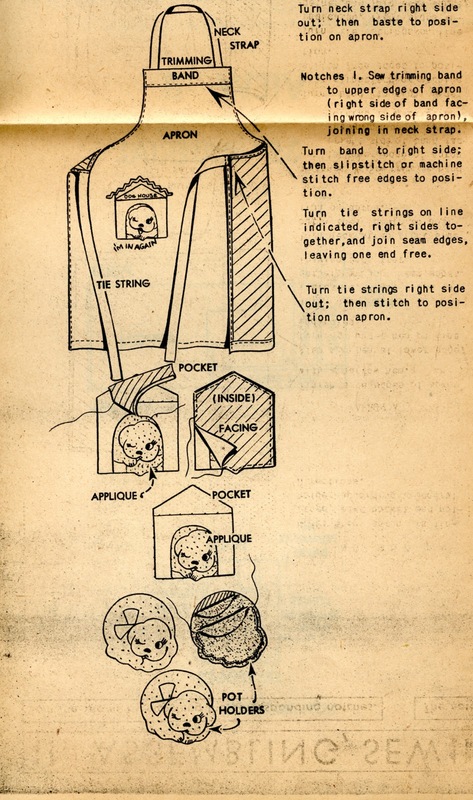 Oh, I bought this pattern for just the same frivolous reason of giving the article as a wedding/kitchen tea gift....I just haven't found the 'right' couple yet to give it to! My daughter Amelia was amused that the Mr. was wearing his apron over a complete suit.. including tie. This pattern is so cheerful that it just makes me happy! I've noticed that patterns for men's clothes often show the gentlemen holding cigarettes or pipes, sometimes golf clubs, and in once case, which I'll eventually feature, something that looks very much like one of those new-fangled Polaroid cameras.